On Aug. 30, students from the Sociology of Law class at Summit Prep attended a symposium that included guest speakers such as Wanda Johnson, mother of Oscar Grant, Gwen Carr, mother of Eric Garner and Samaria Rice, mother of Tamir Rice. The event also included a town hall discussion, a film screening and discussion panels. This event was a part of the Expedition course’s curriculum concerning the understanding of the justice system and its shortcomings. The topic of institutionalized racism is something that Expeditions teacher Lissa Thiele has taught several times within both her Holocaust and Genocide class and her Sociology of Law class. Her focus has been on multiple aspects of institutionalized racism such as the school-to-prison pipeline, the higher incarceration rates of African Americans versus other races and how slavery and Jim Crow laws in American history have affected modern day society. Flimmaker Kristina Williams films Summit Prep students. Following the screening, a mediated discussion with the guest panel of mothers whose children died from police brutality took place. Panel moderator David “Davey D” Cooks addresses the audience. The panel covered topics such as the media’s portrayal of their sons, gathering strength to tell their sons’ stories and the unfairness of losing a child. From left to right: Samaria Rice, Gwenn Carr and Wanda Johnson speak about how their sons’ death affected their lives. Rice said, “I don’t know how they can demonize a 12-year-old,” when talking about how the media twisted the image of her son. Carr said, “No matter what the color of your skin is, what religion you are, wrong is wrong and right is right,” and, “Another mother shouldn’t cry as we have,” when voicing her frustration over the society’s current treatment of how black children and black people are treated. The students who attended this symposium saw this as a trip that was necessary to be a part of. Sociology of Law students and Expeditions teacher Lissa Thiele take a group picture. Other students reiterated the same point as Contreras. Sometimes, finding empathy might be overshadowed by the shame that comes with talking about sensitive topics like race. Two seniors, Anna Axiaq and Jane Abrams, expanded on his points by pointing out the various ways in which parents and the society can stifle the much-needed dialogue. Abrams brought in the history of America and how institutionalized racism has yet to resolve. She said we have to acknowledge “so many problems in our society” such as institutionalized racism in American society. Students saw this missed opportunity for education as an issue, and they said it was only through unity and education that progress can be made. Filmmaker Kristina Williams converses with Summit Prep students. Victor Aguilar, a sophomore at Summit Prep, said that topics like this are “not black and white” and that each situation is going to be different due to the people involved in the case. There were students who disagreed with this stance, saying that police should have more training in how to de-escalate in intense situations. Other students also agreed with what Gutierrez-Hernandez said concerning police conduct with communities. Axiaq repeated a point that Samaria Rice said during the symposium about how officers receive 56 hours of firearm training and only 10 hours of community training. Mother of Oscar Grant the Third, Wanda Johnson, and Expeditions teacher Lissa Thiele took a selfie during Intermission. Ms. Thiele also sees teaching students about social justice issues such as criminal justice and incarceration rates as something that is unavoidable. “The same topics that were current four years ago are still current now,” she explained. A flyer advertises the event at Skyline College. She has seen pushback about teaching such a topic with student’s parents. Ms. Thiele has had a wide range of concerns from parents seeing the class as necessary for their college credentials to: “Does this add value for my child?” or even parents assuming that students are attending a protest. Some parents are concerned on whether all sides are being equally presented in her teaching. Ms. Thiele said that she does represent the sides that are “insane stances” such as Holocaust denial. 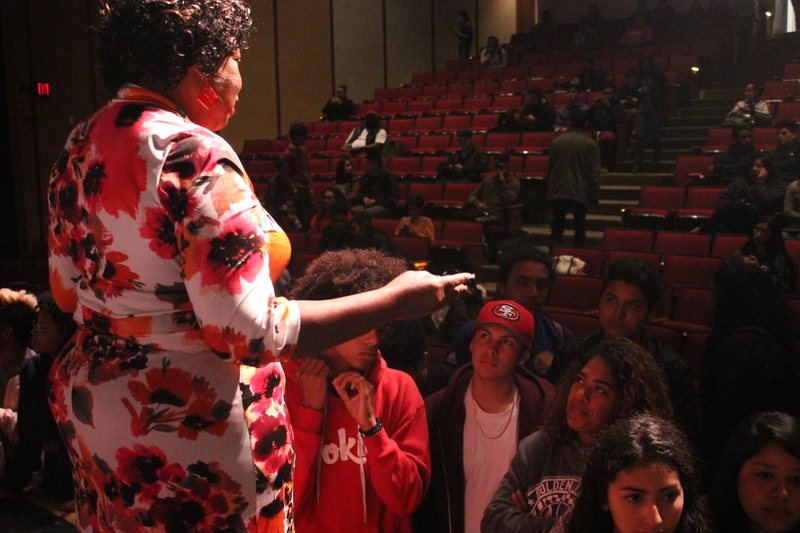 Featured Image (top of this post): Mother of Eric Garner, Gwen Carr, speaks to Summit Prep students.